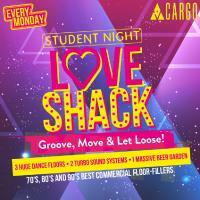 Love Shack for grooving, moving and letting lose! 3 huge dance-floors, let's get bouncy! We are bringing the best of Commercial Hits. You know them, you love them and you know that after a couple of beers you’re going to sing along.